Recently, my husband and I got some good news. We’d been waiting for it for months, and the waiting, and its attendant anxiety, had been tremendously difficult for us. Although we’d done everything we could to stay positive, we were coming to a bit of a breaking point when we got the word. Of course I expected to be awash in relief – maybe not immediately, but within hours at least; but a day went by, then two, then three, and nothing. I continued to feel anxious and ambivalent, labouring through my days as if there were a black cloud over my head, and mine alone. I started questioning the nature of the news: was it not as good as we’d first thought? Was there some lurking underlying reason to hang on to the worry that had been plaguing us all this time? And then I became disappointed in myself: had I lost the ability to embrace the good things in life – or welcome them, at the very least? Had I become one of those people who prefer living under the black cloud? After several days of this kind of torturous myopic musing, my food processor broke. For some reason, the untimely (and, with any luck, temporary) demise of this beloved appliance pushed me over the edge. I have always been slightly embarrassed by my affection for my food processor, and I am more so now since my disproportionate reaction to its failure to thrive: I raged, pouted, craved smoothies night and day, and was generally impossible to be around. But I’m happy to report that, in the days since that cathartic experience, all of my ambivalence towards the initial piece of good news has vanished. I’m ready to welcome a little hope, and relieved that we are on our way forward after being mired in limbo for far too long. And although I am devastated about my food processor, I am holding out for a quick and inexpensive repair job – in the meantime, I’ll make do with the immersion blender of dubious origins that’s languishing in the cupboard. With thanks to my friend Catherine, who inspired me to make this after a long conversation about the glory of beets. Toss beets with 2 tbsp olive oil and place in a shallow, ovenproof dish. Cover with foil and roast about an hour, until very tender. Heat remaining 2 tbsp oil in a large pot over medium heat. Add onions and cook, stirring, until translucent. Add celery and carrot and continue to cook, stirring, a further 5 minutes or so. Add cardamom, ginger, and stock. Add lime leaves (or bay leaves), if using. Bring to a boil, cover, and reduce heat. Simmer until vegetables are tender, about 20 minutes. 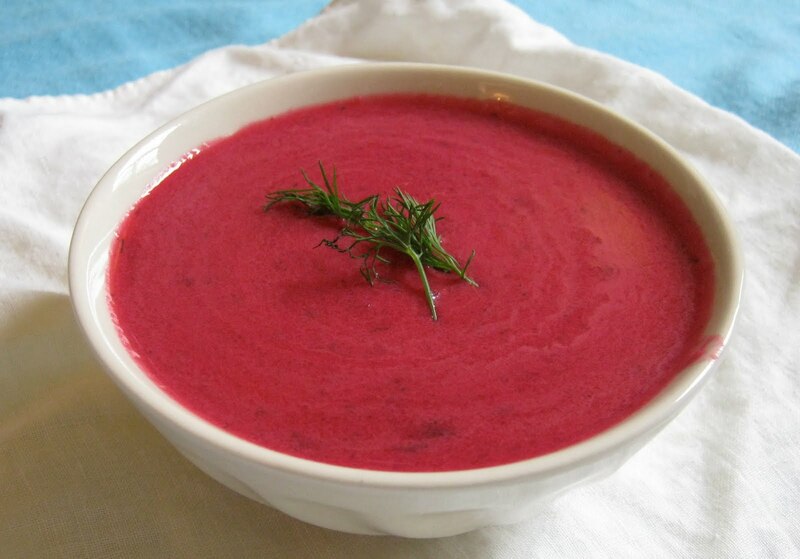 Add beets to soup and use an immersion blender to puree until smooth. Blend in dill, then gently stir in coconut milk and sour cream. Reheat just until hot – do not boil! Serve garnished with more sour cream, if desired, and fresh dill sprigs.